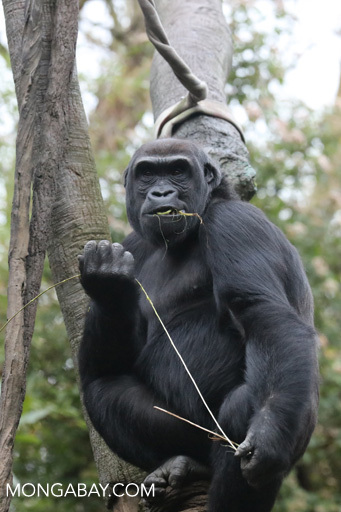 A significant part of the current range occupied by great apes in Asia and Africa is being, and will continue to be, profoundly transformed by industrial agriculture, as range countries intensify commercial agricultural activities to bolster economies and to address the demands of growing human populations. Primatologists, biologists, other scientists and conservationists are working against time to help guide how this brave new world evolves — seeking solutions to how great apes, their forest habitats, and agricultural development can mutually coexist. Today’s foremost challenge lies in finding the tools to address the complexity of industrial agriculture trends and to implement strategies to balance the environment — and requirements of great apes — with socioeconomic requirements. There is also an urgent need for the results of this important conservation research to reach stakeholders and the general public to ensure that everyone is informed about potential solutions: government and NGO policy makers and decision makers, local communities, private industry, the media, civil society and others. The Arcus Foundation’s new book, State of the Apes 2015: Industrial Agriculture and Ape Conservation challenges the notion that the goals of industrial agriculture and ape conservation are mutually exclusive. The book offers numerous examples and case studies showing how humanity can reconcile the goals of industrial agriculture with those of ape conservation and habitat preservation. The Great Apes and Industrial Agriculture Mongabay Reporting Network (MRN) initiative will produce articles that are guided by the new Arcus Foundation book, using the research and case studies it highlights (or solution-oriented case studies found elsewhere), while supplementing this research with phone/email interviews with primatologists, biologists, conservationists, NGOs, and/or officials on the frontlines of great ape protection. Articles will focus on the work of innovative researchers who are facilitating the successful integration of great apes into the changing agricultural landscapes of Asia and Africa. Apes to be highlighted include: Gibbons (Hylobates, Hoolock, and Nomascus), the Siamang, Gorillas, Orangutans, the Bonobo, and the Chimpanzee. Stories will run from 1,200 to 2,000 words, and profile one or more case studies that demonstrate innovative approaches to the future coexistence and viability of great ape populations with the many forms of industrial agriculture (palm oil, tobacco, rubber, and other commercial crops, as relevant). Each article should showcase both the bad (negative impacts) and the good (places where solutions are being created), and describe how those solutions might be adopted in other communities and countries. Pitches will be evaluated based on applicants’ previous reporting experience on wildlife and conservation issues and on ability to write an engaging story on deadline — previous reporting on great apes is a plus. Contributors will work with a Mongabay editor. Draft stories will be submitted to Mongabay between January 15, 2016, and March 15, 2016. Contributors can work from anywhere in the world. This MRN requires no travel. Articles will be published on Mongabay.com and its syndication partners’ web sites under an open Creative Commons license. Contributors will be encouraged to also sell resulting stories to third party media outlets, both mainstream publications and industry publications. 1.) A story pitch (1-2 pages) outlining 1 or 2 story proposals with detailed description of the case study/research to be profiled, the names of primatologist or others to be interviewed, and reasons why this is an important example of how great apes and industrial agriculture can co-exist successfully. Pitch should include reasons why you’re the right journalist for this assignment; and explain your potential to get your great apes pieces published by other major media outlets. 2.) A resume / CV. 3.) A list of at least two media outlets where your work has been published as well as links to 3-5 of your stories.